Guy Gibson leads the First Wave of Operation Chastise off from Scampton on the late evening of 16th May 1943. Below them, other Bomber Command crews head down Ermine Street for Lincoln and a long overdue night off, completely unaware of the moment in history taking place above their heads. 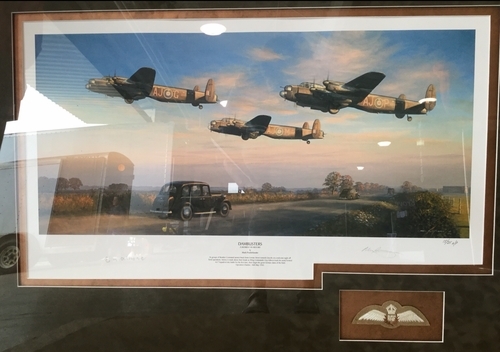 Signed by Eileen Albone, Guy Gibson's WAAF driver at Scampton. Eileen Albone remembers the night very well. After driving Gibson out to his aircraft, she parked on the perimeter track and watched them take off.